A day at the beach, in a bottle. With natural sea salt and kelp extracts to exfoliate and revitalize for glowing skin. Seaweed, sea salt, sea kelp, sea water, I’ll pretty much try anything that originated from the sea (or has the word “Sea” in it). More importantly, I love a good physical exfoliant (always and forever) and they claim that this stuff is not only hypo-allergenic, paraben-free, and cruelty free but also made with 100% natural exfoliants (Sea Salt and Kelp) so that’s cool. I also like that the word “Exofoliating” is highlighted (you know they mean bidniz when words start getting highlighted). I’m not sure when or where I picked up this huge thing of Sea Salt & Kelp Body Wash but I’m so glad I did! Why? Because this stuff is magic! I haven’t had much luck with St. Ives products in the past but it’s like they took all the things I complained about in my St. Ives Apricot Scrub review (here) and formulated the most perfect exfoliating scrub.. of all time! Scent-wise this stuff reminded of Nivea Fresh Natural Anti-Perspirant (reviewed here) as they both had that subtle, fresh, delightfully oceanic (almost masculine) scent, that I personally find to be quite pleasant. Scents like that always make me happy, because I usually associate those scents with summertime at the chalet (beach house), for whatever reason. The pleasant fragrance was more than enough to bump this body wash up to a “good”, but its performance as a scrub catapulted its status straight to “stellar”, in my book! Here’s where the magic comes into play. This was a very fine scrub yet extremely gritty, all at once! Witchcraft, I say! Texture-wise it reminded me of my beloved MAC Mineralize Volcanic Ash Exfoliator (reviewed here) because they both felt like powder-soft wet sand, except the St. Ives Sea Salt & Kelp Body Wash was less paste-like and more liquid-y (lathers really well), and the exfoliating granules in it didn’t melt away immediately upon contact with water. Regardless of how fine the granules were, they were quite gritty yet still very gentle somehow, and exfoliated my skin evenly, as opposed to other products with chunkier granules that tend to skip over certain areas (I’m looking at you St. Ives Apricot Scrub). It blew my mind how this stuff was so fine, yet exfoliated my skin so efficiently (magic!) with minimal effort on my part! 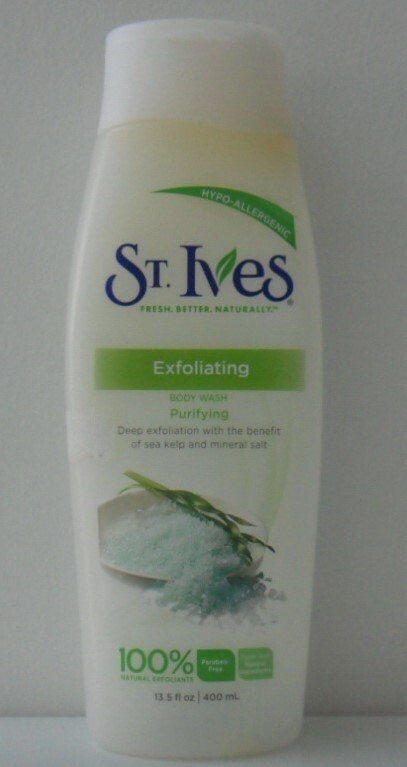 In fact, this St. Ives Sea Salt & Kelp Body Wash was so gentle that I’ve even taken to using it as a face scrub! I would petition St. Ives to start formulating a face scrub version of this body wash but this stuff is delicate and gentle enough to use as a face scrub regardless of what it’s being marketed as, so why bother? St. Ives Sea Salt & Kelp Body Wash exfoliates my face and body perfectly and leaves my skin feeling great (soft, supple, clean)! It’s everything I wanted Lush Ocean Salt Scrub (reviewed here) to be… and more! As if all that wasn’t enough, I’ve noticed that the St. Ives Sea Salt & Kelp also has a healing touch! What I mean by that is that this stuff somehow manages to clear up any sort of blemishes (zits, pimples, acne flare-ups, eczema, etc…) on the skin. It also helps to prevent ingrown hairs. Best of all, it speeds up the healing process of minor cuts and scrapes! All that without actually ever stinging or burning or causing any sense of discomfort (so delicate)! I’ve always believed that a quick dip in the sea is a natural remedy for all of the issues listed above. St. Ives Sea Salt & Kelp Body Wash is effectively the same as taking a quick dip in the sea (minus the moisture zapping effect that sea water can have on the skin)! St. Ives Sea Salt & Kelp Body Wash has a pleasant fresh aquatic unisex scent, lathers up nicely (a little goes a long way), sloughs off dead skin effectively and evenly, is both delicate enough to use on the face but also gritty enough to use on feet, and has a healing (“purifying”) touch! So, in a word, magic! Even though the bottle is huge (400ml) I went through the whole thing pretty quickly because it’s just that good! Now that I’ve ran out of this stuff, I really wish I could remember where I got it from because I’d love to repurchase this budget-friendly, magical body wash, but just can’t seem to find it anywhere.